1. TRIP THROUGH THE BIBLE - I tell the kids that we are taking a trip through the Bible but will never leave our seats. I begin by saying "I took a trip through the Bible and found "Abraham". The next child will repeat what I said and then add something they found that begins with the next letter in the alphabet and so on. So the second child says "I took a trip through the Bible and found Abraham and Beersheba". The third child says "I took a trip through the Bible and found Abraham, Beersheba and Canaan". Play continues for the whole alphabet. 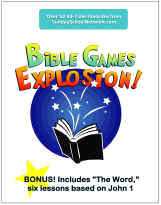 An exciting Bible card game for kids and families! 2. ALPHABET OCCASION - Use Christmas, Easter, Pentecost, Jesus, Books of the Bible, Heroes, Old Testament, etc. as "topics". Choose ONE topic for that session. On the board, write the TOPIC and then each letter of the alphabet with 2 blank lines next to it. Create teams and have each child take a turn giving a word from scripture that begins with any letter. (IMPORTANT - The words must be pertinent to scripture. For example, if the letter is "t" then an acceptable answer would be Thomas, tithe, Ten Commandments; answers that are not acceptable are normal everyday words like "the, them, tomorrow, to.") Once those two blanks are filled in for each letter, no one may give another answer beginning with that letter. Have the children "justify" some of their questionable answers. You'd be surprised that they will learn and what you will learn. 3. BRAINSTORM THE BIBLE LETTERS - The second one is using a similar idea. Choose any letter and go around the room (or form teams) and ask each to give a word (person, place, thing, etc.) from scripture that begins with that letter. Play continues until teams cannot think of any more words. Then choose another letter. Over 52 Bible Games for year-round fun! Dozens of high and low activity games for indoors and outdoors! With Bible memory games! Click here!